Congratulations to these JDJ team members on their promotions (l to r): Shawn Whitney, Jeff Burke, Brittany Quarantello, Bekah Paradise, Mallory Garneau, Brett Dietz. We are very pleased to announce the promotion of several team members. Brett Dietz, CPA, MST and Shawn Whitney, MSF have been promoted to the role of Manager. Mallory Garneau and Brittany Quarantello have been promoted to Associate 4. Jeff Burke has been promoted to Associate 3. Bekah Paradise has been promoted to the position of Associate 2. 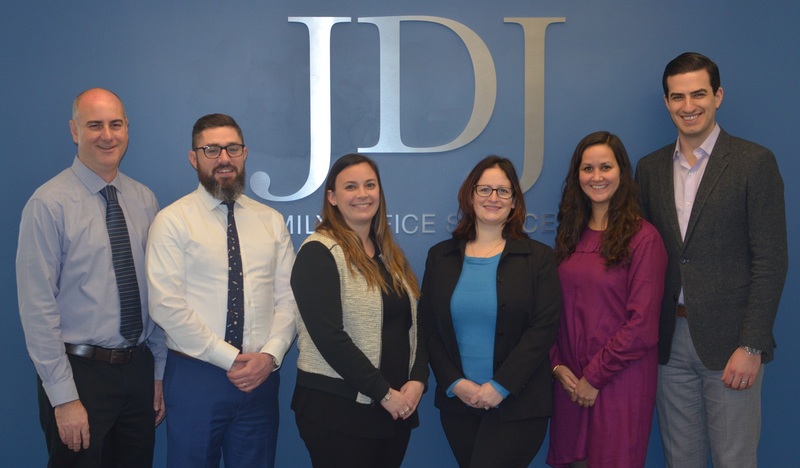 “Brett, Shawn, Mallory, Brittany, Jeff, and Bekah epitomize the diverse talent JDJ brings to providing family office services. We thank them for their dedication to delivering outstanding service to clients and advisors. Please join me in congratulating them on their well-deserved promotions,” said James M. Kittler, President of JDJ Family Office Services. JDJ Family Office Services is an administrative multi-family office created in 2001 to serve affluent individuals and families. JDJ was founded on the premise that as wealth increases, so does the volume of day-to-day financial and administrative responsibilities. JDJ simplifies the lives of our clients by managing these responsibilities for them, offering a variety of high-end, confidential, customized, customer-focused services performed by professionals who have an expertise in both finance and administration. Services include personal accounting and net worth reporting; budgeting and cash flow planning; bill paying and expense reporting; tax planning coordination; investment and balance sheet administration; trust and estate administration; and lifestyle management.